TUB | S&P Canada Ventilation Products, Inc. 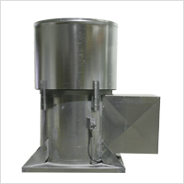 Exhaust air up to 60,116 CFM in static pressure applications up to 1" w.g. Capacities range from 6,210 to 60,116 CFM, with static pressure capability up to 1". Fan selections are available in 24, 30, 36, 42, 48, 54 and 60 inch sizes. Horsepower's range from 3/4 to 15HP. Blade selections is available in aluminum, steel, or fiberglass reinforced polypropylene. Units are tested in accordance with AMCA 301 (sound) and AMCA 210 (air) in an AMCA certified laboratory. Every unit is completely assembled and factory tested for quality assurance prior to shipment. 24 30" 35" 25-1/8" 55-1/2" 25" 30-1/2" 37"
30 36" 41" 31-1/8" 58-1/2" 28" 30-1/2" 40"
36 42" 47" 37-1/8" 60-1/2" 30" 30-1/2" 43"
42 48" 53" 43-1/8" 65-1/2" 33" 32-1/2" 46"
48 54" 59" 49-1/8" 68-1/2" 36" 32-1/2" 49"
54 60" 65" 55-1/8" 71-1/2" 39" 32-1/2" 52"
60 66" 71" 61-1/8" 74-1/2" 42" 32-1/2" 55"